Fidget the Dog would like to be associated with this quarter for joining us on vocals on attempt number one and having to be shut inside for the rest of the duration! Rung to mark our love of York, without which we would never all have met and to celebrate a much needed reunion weekend in Ipswich :) With many many thanks to Jonathan and Susan Williamson for their help and hospitality. 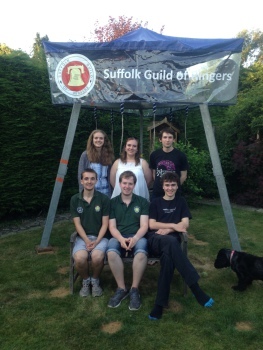 This performance is linked to the event York Colleges Guild — Ipswich Summer Outing. Last updated Saturday, 6 August 2016 at 19:05:24. First submitted Saturday, 6 August 2016 at 19:00:19 by Lucy Williamson.